PROJECTS will depend on season, needs and resources. They may include nursery, facilities, composting, food forest, garden-building and weeding. You can expect to do real work, get grubby, and make the world a better place. NAVIGATE Note that Gate is locked on weekends, so arrive on time. 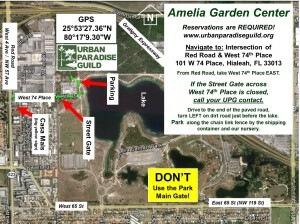 See the UPG map for driving directions. Do NOT use Google – it will get you lost. 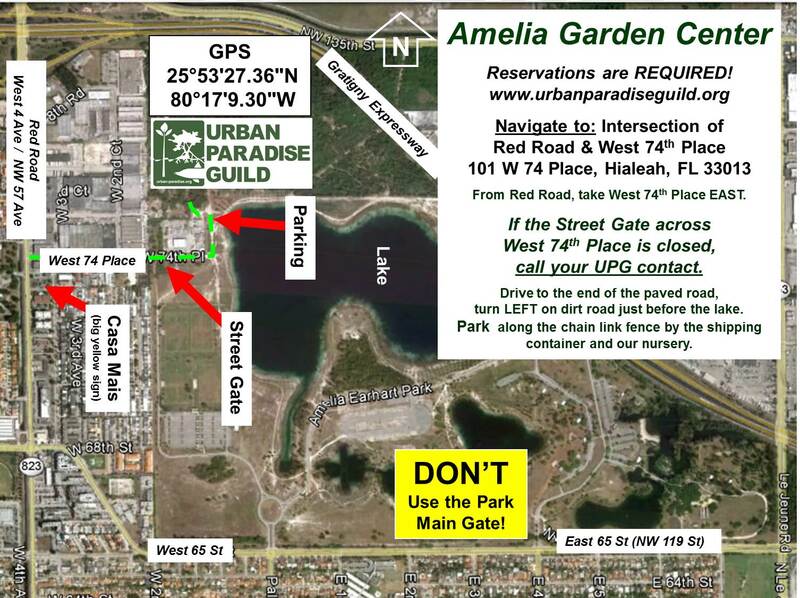 Navigate to NW 57th Avenue and West 74th Place, Hialeah, FL 33013. Drive east on West 74th Place into the Park Service Entrance until you reach the lake. Turn left on the dirt road. Park next to the shipping container about 100 yards down on your left. Watch your e-mail: you may receive special instructions the day of the event. You will NEED them to find us! BRING / Wear / Prepare Bring a water bottle, closed-toed shoes & dress for the weather. Gardening gloves, favorite sunblock and bug repellent are optional. UPG will provide Tools, Gloves, and endless ice water refills. You will be doing real work, so eat a real breakfast (you will need the energy). BATHROOM There is no bathroom on site. Plan accordingly. Subject: Group for (insert Place & Date). Include your cell#, the number and ages. CHILDREN If you would like to bring children, please send an e-mail to the site leader (see below). Subject: Children for (insert Place & Date). Include your cell#, the number and ages. IMPORTANT: By registering this activity, you confirm that you are 18 years or older and agree to the terms on this page. Hands Off Legion Park – No Special Area Plan (SAP)! Copyright © 2019 Urban Paradise Guild. All Rights Reserved.